Nothing is as international as the language of music, especially microtonal music, including that in the 31-tone idiom. In the Netherlands and America particularly, musical renewal proceeds along this way. In the past, an extended American tour of Huygens-Fokker in the season of ’76- ’77 was almost a logical sequence to all this. 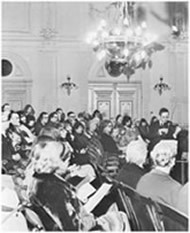 Meanwhile, the many successfully Fokker-organ concerts in the Netherlands during the seventies and eighties of the twenties century were as always organized in the Teylers Museum of Haarlem, year after year. During the nineties, besides the Fokker-organ and archiphone concerts, many other microtonal concerts took place, sometimes with, sometimes without the famous Fokker-organ. The office moved to the Ysbreker music centre in Amsterdam and new concerts took place on this location. The twenty-first century had a tough beginning, due to the removal of the Fokker-organ from the Teylers Museum and the moving of the office and activities to a new music centre in Amsterdam, the Muziekgebouw aan ‘t IJ. Anno 2009 the foundation is flourishing more than ever, with the Fokker-organ soon placed in this building and the many forthcoming microtonal concerts and activities.